Something that you might have missed on Monday was a very interesting programme in the This World strand on BBC2 called Battle of the Bishops. The programme primarily focuses on Archbishop Akinola and some of the other GAFCON during the run up to the conference. There are also contributions from Colin Slee, Dean of Southwark Cathedral and Bishop Tom Wright, and a visit to the Falls Church in Virginia, one of the most high profile split congregations (it counts several high ranking government officials amongst it’s membership, and can count George Washington as one of it’s former Churchwardens) where the bulk of the congregation have split from a small group that remain loyal to the Episcopal Church. Aside from seeing some of what went on at GAFCON, the programme also shows something of the Anglican Church in Nigeria, and in particular a hint of the almost explosive level of growth that the Anglican Church in Nigeria is enjoying. I certainly don’t expect that as a programme it will make anyone change their minds, but it certainly underlines the fundamental differences in what those in Africa understand it is to be Anglican, and how we in the West understand it. The programme will be available on iPlayer until next Monday, and I highly recommend taking a look if you get the opportunity. As I watched the news yesterday morning with the announcement of what is effectively an Anglican split – the GAFCON group is saying that they will stay within the Anglican Communion, but will operate independently of the instruments of the communion – I couldn’t help but chuckle at the irony of the day on which they chose to make the announcement, the day of the Feast of Saints Peter and Paul. It may seem slightly odd that with many of the obscure saints across the Christian calendar who have a day to themselves, the church chooses to celebrate perhaps two of the most important saints together – but when you consider that these were the two people on whom the Church was built you can maybe start to understand why they are considered together. It is especially important when you start to look at the evidence within the New Testament and realise that whilst in later times the official recognition of Christianity in the Roman Empire needed some degree of orthodoxy to be imposed, back in these early days, Peter and Paul had significant differences in their opinions on a multitude of subjects in particular as the Church started to draw in Gentile converts alongside the original, Jewish membership. Check out Mum’s sermon from yesterday that explores further the differences between Peter and Paul. The annual survey of Church attendance figures has just been published, and as usual it is an opportunity for the media to publish a load of stories highlighting the figures. The Times in particular really went for it including this article – Churchgoing on its knees as Christianity falls out of favour – which in particular plays the Muslims will outnumber Christians card, and is being disputed by the organisation who conducted the research. As the Church of England response to the survey points out it does this using a figure taken from census data and compares it with the actual Church attendance – if a similar ploy was used to calculate numbers of Christians from census data the figures would show something like twenty million active Christians in the UK. As the Religious Trends Survey shows, an ageing generation of churchgoers is about to die out and there could be, within a generation, a God-shaped hole at the heart of our society. The decline forecast for the Church of England is so severe that its position as the established church of the nation with the Queen as Supreme Governor can surely no longer be tenable. Yet, as the report notes, the decline in attendance coincides with a surge of interest in religion, reflected in the growing numbers of children opting for religious studies at GCSE and A level. There are also increasing numbers of students at theological and Bible colleges. Somehow, the churches, despite innumerable studies, reports, synod and assembly debates, are failing to get these people into church. The main Times article again puts forward that only the evangelical churches are growing – which from my point of view is wrong. Seriously, Ruth Gledhill should come along to Finchampstead sometime as St James is anything but evangelical. We’re a mainstream middle of the road Anglican church, and yet for the past two years our electoral roll figures have gone up by more than 10% a year, and as I mentioned back at Easter we were struggling to find seats for everybody then. Whilst it is certainly correct to say that our growth area is in the young families, as our Rural Dean pointed out at his recent inspection we manage to produce a respectable fifty to sixty or so people at our prayer book services too. As far as I am concerned the parts of the Church are growing aren’t anything to do with their Churchmanship – churches of all denominations and types are growing – it’s about getting the basics right, and looking at what people want. In the case of the prayer book services what people are looking for is familiarity and authenticity, so those are done absolutely straight with traditional hymns, and the King James bible. On the other hand the young families, who often come in via our play-group, are looking for accessibility, which is what they get through our 9:30am Family Services. The main 11am services are a bit more of a blend of the two, so we’re relatively traditional, with organ, choir and sermon, but with more accessible elements. The biggest thing though is to be a welcoming community. It is always frustrating to hear of other churches that are spending more time turning themselves into a private club and excluding people – as far as I am concerned whilst things have changed at St James to bring about our rise in numbers, they haven’t been particularly radical, and to be honest if they were radical we’d only end up marginalising a different group. The whole basis of what we do is to be inclusive of the broad range of people in the village rather than exclusively focusing on one group. Whenever the â€œhow do you do it?â€? question comes up though, most people at St James’ really can’t explain, as from our point of view we aren’t doing anything particularly special or out of the ordinary, and equally the area around the church from which our attendance is drawn isn’t that much different from much of the surrounding area either. So, here we are, 8th January, the Christmas lights are gone, it’s dark in the morning, and dark in the evening, and we’ve got what looks to be an endless series of storms coming across. I’ve been back at work for five days, Beth only two, and it already feels like we’ve not been away… and I’m sure we’re not alone in feeling the same. 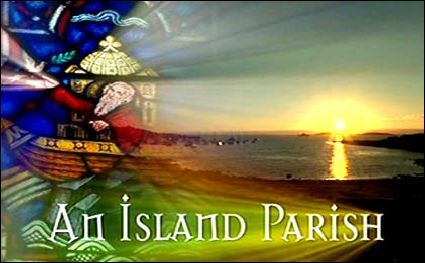 As in previous years, this is the time that the BBC start on a new series of Island Parish, showing the lives of people living on the Isles of Scilly and revolving in particular around the Church of England priest on the islands, the Rev Guy Scott. It’s probably the filming, but it has to be said that the programme even makes the bad weather on the Isles of Scilly look somewhat appealing – certainly more than the wind and rain outside the windows here. The first programme reintroduced us to some characters from last year, and also some of the new people for the series this year. So we meet Rev Guy and his family again, and we also meet the new vet, who arrived towards the end of last year, and has been discovering the difficulties of making a life on the islands – the relatively small numbers of sick animals being the main problem. Looking at the opening credits, the policewoman who swapped life in Plymouth for a summer on the islands is going to be back – although she didn’t appear tonight. We also have some interesting new people in the form of the baker who moved to the islands fifteen years ago after his divorce. In tonight’s programme he and his daughter were making plans to buy the local pub – the commentary dangled the high cost of the pub and questions about they could afford it – it wasn’t until towards the end that you found out the twist – his ex-wife is selling her house in Brighton and moving down to the islands in order to go into business. It does on paper seem like one of these recipe for disaster type decisions – but then Island Parish is one of these gentle documentaries, not particularly hard hitting, so I suspect it will all work out reasonably well in the end. From a Church point of view, there were a couple of choice moments. I mentioned in one of my postings on the series last year the slight bit of controversy there had been over the lack of acknowledgement given to the Methodist Minister on the island. This time around, the programme showed a joint Anglican/Methodist service, and even features the Methodist Minister saying something – unfortunately it’s the point where he bounds up to assist Rev Guy with his Mothering Sunday sermon, and makes a joke about a pair of waterproof pants… Hopefully they’ll do something to try and redress the balance over the rest of the series, as at the moment if I were the Methodist Minister I’d not be overly happy. With Rev Guy in post, I suspect we’re not going to get as much of the Church politics as we did last year – unless of course the brief clip of the PCC was a pointer to something to come… We’ll have to wait and see. If you missed it, the programme can be found on iPlayer for the next few days.